With so much going on when you move into a rented property, it can be difficult to keep up and ensure everything’s as it should be. As such, a checklist is required – and fortunately, we’ve created one for you to use. Before you even begin to unload the removal truck, you need to walkthrough the property and ensure everything is as it should be. Check the inventory – it’s what has been agreed between you and the landlord and covers what’s included in the rental price. This includes the washing machine or dishwasher. It’s also worth checking the condition of any fabrics – such as the blinds or furniture included as part of the deal. You’ll want to bring up any issues now, rather than later down the line. Many properties that have been left empty for a sustained period of time suffer from mould and damp issues – typically because windows haven’t been left open to allow the property to breathe. Unfortunately, mould and damp can be detrimental to health and is a common cause of complaint amongst tenants. You can request mould and damp issues to be remedied before moving in. 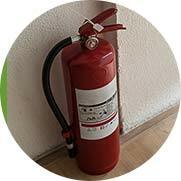 Your landlord is responsible for ensuring fire safety measures are in place and of course, this includes having a working smoke alarm when you move in. It can be easy to overlook, so double check your alarm is operational. When you move into any rented property, you should expect all appliances to be in a good working order – this includes the light bulbs and fittings, such as blinds and curtains. There’s no reason why you should foot the bill, so make sure to leave no stone unturned. Any dripping taps in your property are a landlord’s responsibility – so don’t leave one unrepaired. 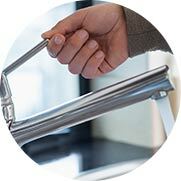 Note down any of the taps that are overly loose, dripping or even tight. They can then be seen to. As the security for your home, locks needs to be well fitted and working properly to keep you safe. There should be no problems when trying to lock or unlock any of the windows or doors in the property, so go through and double check each. You could also request a change of lock for the front door if it’s been a while since they were last switched. Remember, in the event of burglary, insurance companies are unlikely to pay out if there are no signs of forced entry. One of your sole responsibilities when moving in is to arrange the utility bills (unless they’re included in the rental cost). Note down your electricity, gas and water meter readings and call each company up respectively to notify them of your occupancy. You’ll also need to arrange council tax, a TV license, phone line and Internet – amongst other optional extras. As a tenant, fortunately much of the responsibility falls on the landlord’s shoulders. Of course, you’ll need to keep up with your monthly payments, but for general repair work you’ll be able to pass this over. Of course, one of the main points of conflict between landlords and tenants, is typically centred around repair work and what should and shouldn’t be completed by the landlord. Also bear in mind that landlords have a legal right to enter a property for an inspection or to carry our repair work. However, at least 24 hours’ notice must be given – unless the situation is deemed an emergency. Be aware that if repair work isn’t carried out promptly, tenants do have a claim to receive a reduction of their rental payments. This is known as ‘rent abatement’ and is the result of incomplete work or repairs being disruptive. Although you’ll be renting, there’s still an element of responsibility that falls on the tenant – particularly in regards to keeping the property in a good condition. You must also allow the landlord to have access to the property when 24 hours of notice is given, whilst emergency situations require immediate access. If you don’t meet these responsibilities, the landlord has the right to file for eviction. When arranging to rent a property, you may be required to provide a proof of address and other form of ID – so ensure you have these to hand. This could be for the estate agent, or the landlord. 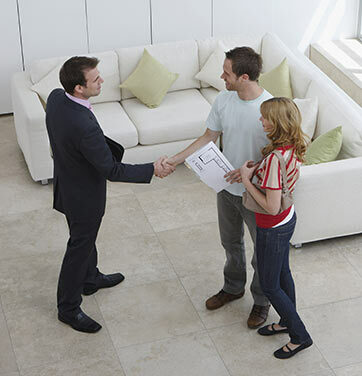 A landlord may also ask for a reference from your previous landlord (if you’ve previously rented). Remember, if the landlord requests to meet you in person, it’s a good idea to take a friend or family member with you – both for safety purposes and to ensure you have a second opinion readily available.